Yesterday I went through four memory cards worth of photos looking for gems. It’s time for me to print a few. Since I came back from the island I haven’t deleted anything from them, or even really looked at the many pictures I took while I was away, because the weather was so gloomy gray and so many of them are disappointing. The images went back to late winter, and then into the nonstarter of a spring and blazing summer. I watched the data change for each image, noting the adjustments I made. I found the day where I waited for my bus from a grassy patch and really—really—figured out what ISO adjustments do as I shot car after car. I found a garbage truck that I shot simply because it reminded me of a friend whose little boy loves garbage trucks. I saw my guru tree, which still had no leaves on May 20 and which had me a little worried. I saw the local antique barn in radiant red and green on a brilliant blue day. I saw the world’s longest covered bridge, which is silver and gray and doesn’t really make a very nice picture even on a good-weather day. I saw a salad I tried to shoot and failed; I don’t know what happened there, but it’s ugly and the best part of the photo is the three scattered torrone boxes I moved out of the center of the shot. At the covered bridge I learned about white balance. This is the best image I got that day, the one where the greens are truest. It didn’t help the bridge, which I thought was made out of corrugated metal until I got home and read about it. And, I mean, look at this picture. Does it make you want to go inside the world’s longest covered bridge? No, it does not. I am learning to like learning by frustration. I am learning to like my mistakes for what they have to teach me. It’s taking a while, but I’ve got patience. It’s a whole new language, really. My accent’s going to be weird for a while. You don’t need to understand the first thing about the half-math/half-magic that converts Fahrenheit to Celsius. What matters is that all the days—all the days!—are above zero. Zero is freezing. A week above freezing. It’s about time and worth every italic. I’m looking forward to taking my camera outside now that there will be a little more color in the world. Even soggy brown spring days are better than you-know-what. I scanned back through my folder of photos and these city shots are the ones that have me excited for more. Something I do love about the bus (amid all the things I detest about it) is the liberty to look at people from behind and see all the things that aren’t front and center about their appearance. Gray hair is a biggie. The curve of their own neck. This girl had a red pin stuck in her backpack and before she got off the bus I asked her if she minded if I shot it. Beneath her green hoodie she wore a colorful headscarf. I took this one a few weeks ago when I took that picture of the shell. 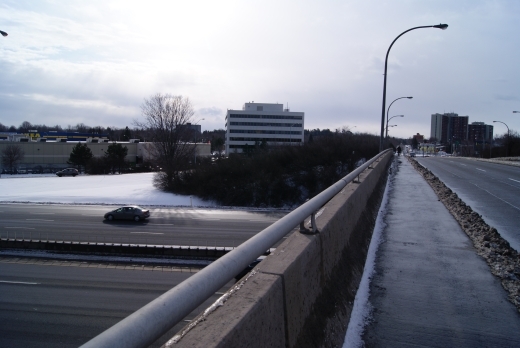 The bus dropped me off on the wrong side of the highway, and I had to walk across that overpass. I’m not great with heights to begin with, but when the sidewalk is covered with black ice and cars are noisily flying below—well. I hold on to the handrail and hope for the best and breathe very deeply when I’m done. The Kindness Meter is a regular parking meter repurposed to collect money that people would ordinarily give to panhandlers. Don’t you think it’s absurd that the Kindness Meter is out of order? Even so, though, there’s love. Much, much love. See? I want there to have been a scavenger hunt. I want there to be a dozen more of these all around town. I want someone to have swooned while tracking them down. I want them to have led to a warm cup of hot chocolate and kisses and unmentionable things. I’ve got a spare camera battery now. And those warm days are just in time. A grown-up camera. I am still learning; I’ve only had the thing for a little more than a month and I have no idea what it can do, but I practice with it, and I pay attention. I’m learning to see with its eye. If you responded to this prompt on your own blog, please point me to it in the comments! I’m trying to catch as many Reverbers as I can during this month as a member of the crew.